Having previously believed I hadn't seen an Essex Skipper, the last on my Sussex list, I've just found out I've seen one after all. Looking back at some old photos I found this little fella (or lady). 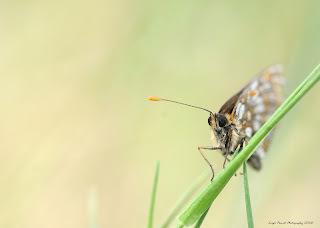 The black tips underneath the antennae very distinctive - though how I missed this I don't know! Makes you wonder how many Essex are mistankenly identified as Small Skippers? They are probably much more widespread than we think. 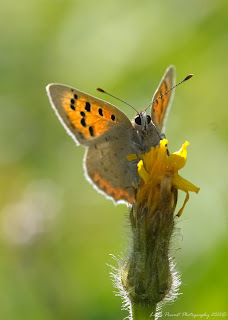 So I have now seen all regularly breeding Butterflies in Sussex. Mid morning I made the long drive and hike up to Windover Hill in hope of catching my first Grayling sighting. 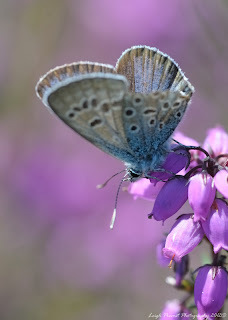 On the way up Chalkhill Blues were everywhere to be seen, they were pretty much the only butterfly I saw. 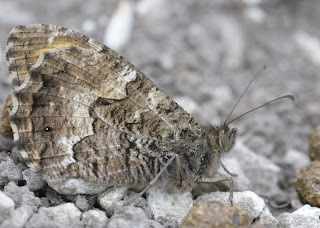 On Windover Hill itself it didn't take too long before I was on my hands and knees looking at my first ever Grayling, to others it might have seemed I was just looking at a bare patch of earth, due to their fantastic camouflage. It is true what they say, off the 10 or more I saw, not one opened it's wings for me, or took advantage of a more loftier position. The ground was good enough. Furthermore, I only caught a glimpse of the eye patch on a few occasions. There were a couple of mating pairs as well. 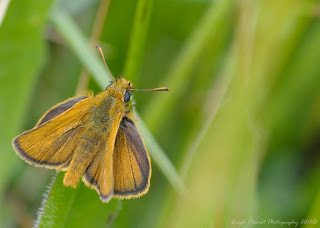 Other highlights include an all but brief glimpse of a Silver-spotted Skipper, a Small Heath and numerous Meadow Browns. Walking back down the South Downs Way, I ticked off Gatekeeper (lots around the Gorse Scrub just before the top of the chalk track), at least 5 Dark-green Fritillaries, and 2 Marbled Whites. Back at the 'bumpy' carpark in the Southwest corner, there was a small population of Whites, including Large, Small, and Green-veined. I also saw a Six-spot Burnet Moth which had just emerged from its papery cocoon. With the promise of some sun at last I decided to take a day's holiday and tour some of Sussex's Butterfly hotspots. The only decision I had to make was East or West. I plumped for West. My first stop was Kithurst Hill. 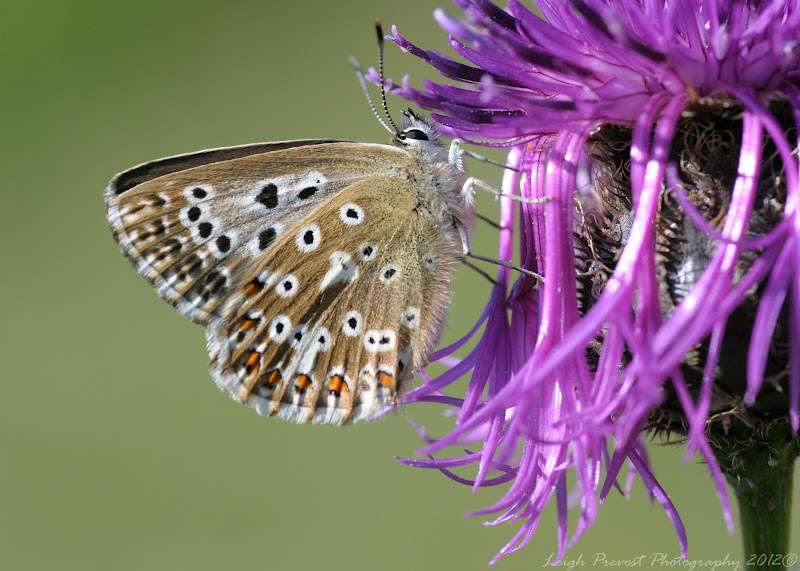 What a fantastic place at this time of the year, the meadow was alive with Butterflies! 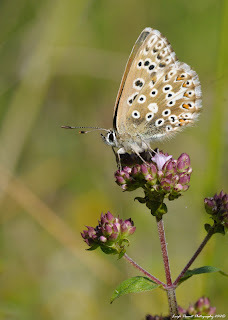 Freshly emerged Chalkhill Blues were everywhere, too many to try and count, ditto Meadow Browns. 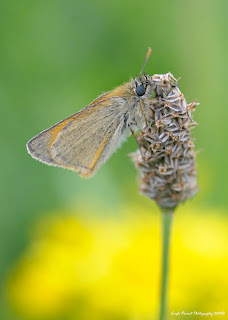 There were also many Marbled Whites, numerous Small Skippers which I tried to turn into Essex Skippers to no avail, a handful of Large Whites, one Small Blue (second brood), a few Gatekeepers, and one Small Copper. 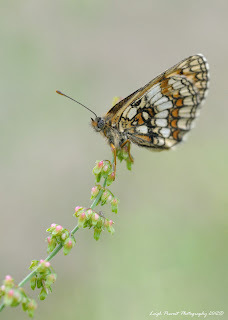 Best of all, and unexpected, were two Dark-green Fritillaries patrolling the lower slope by the hedgerow. After Kithurst, it was on to Iping Common, I didn't get the chance to see the Silver-studded Blues earlier on in the year but hoped I may catch a few lingerers. 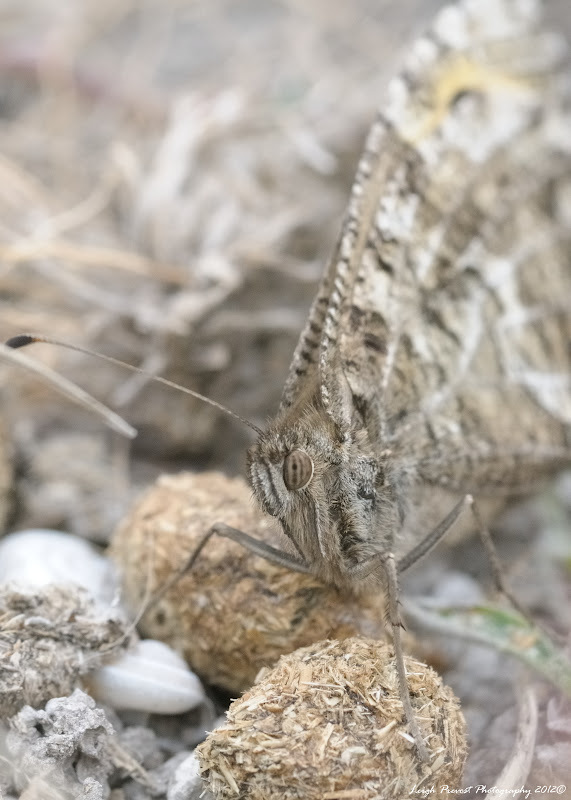 In total I counted at least fourteen albeit, fairly worn specimens. 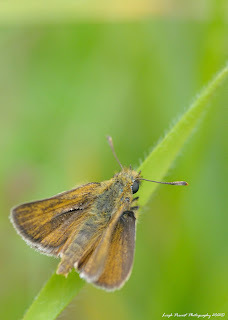 Apart from the Blues it was fairly quite, a few Skippers, Meadow Browns and a Speckled Wood. 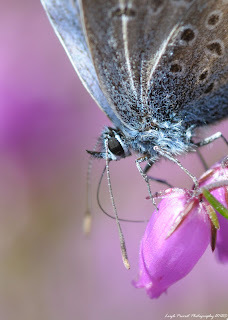 Next stop, and last of the day, was Southwater Wood in the hope of catching a glimpse of "His Majesty". I parked up at Trout Lane and headed to the Master Oak. 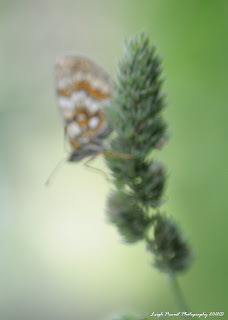 Within a few minutes (at 2PM on the dot) a Purple Emperor flitted across the glade, soon after a pair (?) followed along the same path. I didn't have long to wait for another sighting, just five minutes or so. However, they were all flitting, tantilising glimpses. Eventually after a thirty minute wait or so, I saw one land in the Ash and managed to get a record shot. Whilst looking skyward I noticed at least two Purple Hairstreaks in the canopy of the Master Oak, one spiralled downwards but I couldn't keep track of it. Damn! After a brief stroll around the woods I returned to the Master Oak. Where again "His Majesty" made a few fleeting appearances over the next thirty minutes or so. I counted at least three individuals possibly five but hard to say. 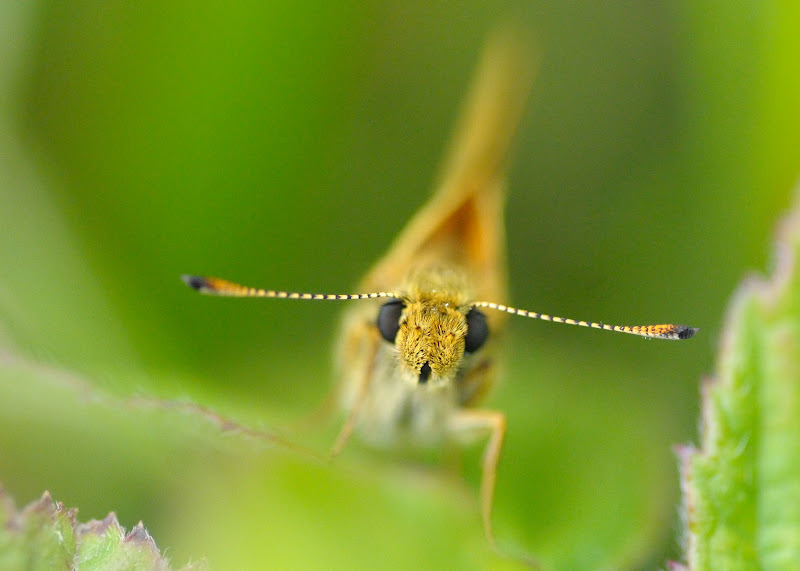 I also met Dan and his wife who were as chuffed as I was to final catch sight and photograph this elusive Butterfly. 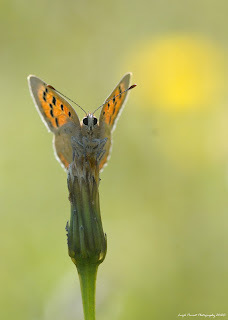 I should note also that I also saw one Red Admiral three-to-four Silver-washed Fritillaries, numerous Meadow Browns, Large Whites, Skippers, and one Comma. Notably no White Admirals though. All in all a good day out butterflying, finally. Total tally for the day sixteen. After a fairly forelone summer of butterflying, the last couple of weekends have proved fairly more fruitful. 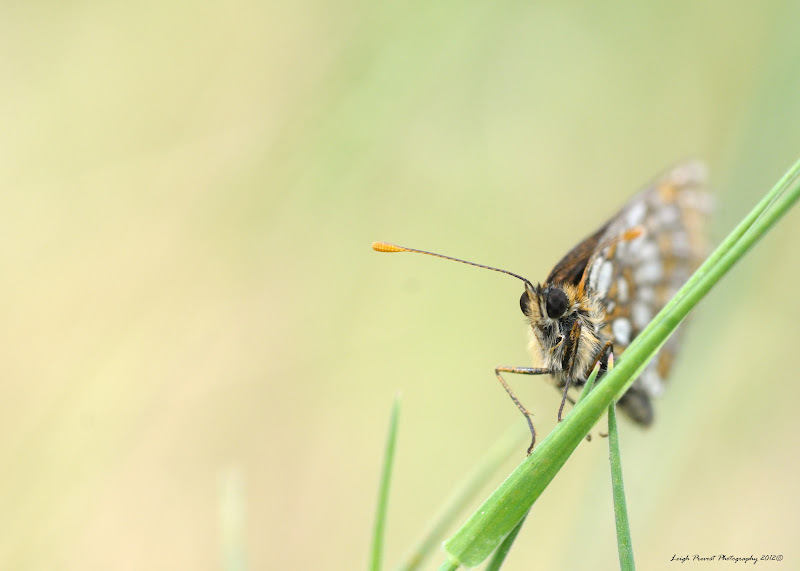 Hot on the tails of the Heath Fritillary last Saturday at East Blean Woods, I saw my first Lulworth Skippers at Durlston Country Park, Dorset. This brings my UK Butterfly List to 47 and I have now seen all the UK Skippers bar the Essex Skipper. 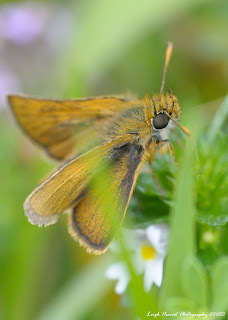 Whilst often overlooked I find Skippers strangely beguiling Butterflies. A few shots below. 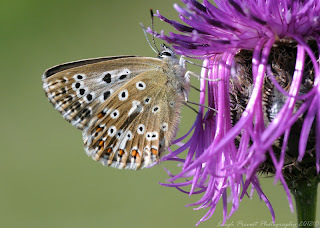 A Butterfly at last... and what a good one! What with the terrible weather I haven't braved it out with my camera for a long time; however, with a trip to see the in-laws down in Kent I decided to call in at East Blean Woods near Canterbury. 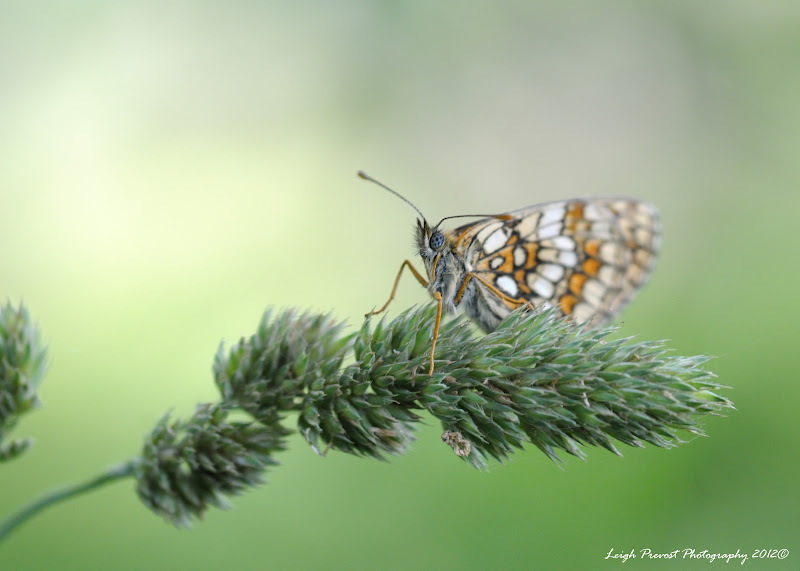 Must have passed close to this place 50 times or so without realising that it is home to a small population of one of our rarest butterflies, the Heath Fritillary or Melitaea athalia by its latin name. While conditions were almost perfect, I wasn't going to get that lucky and the wind played havoc with my photography to say the least. However I did manage a few shots that I was pretty pleased with. Please see my favourites below (please click on image to view at high resolution) - the last one demonstrates the difficulties I had but I quite like it nonetheless - feels a little dreamlike (nb I also rotated this 90 degrees anticlockwise as I prefered the composition). 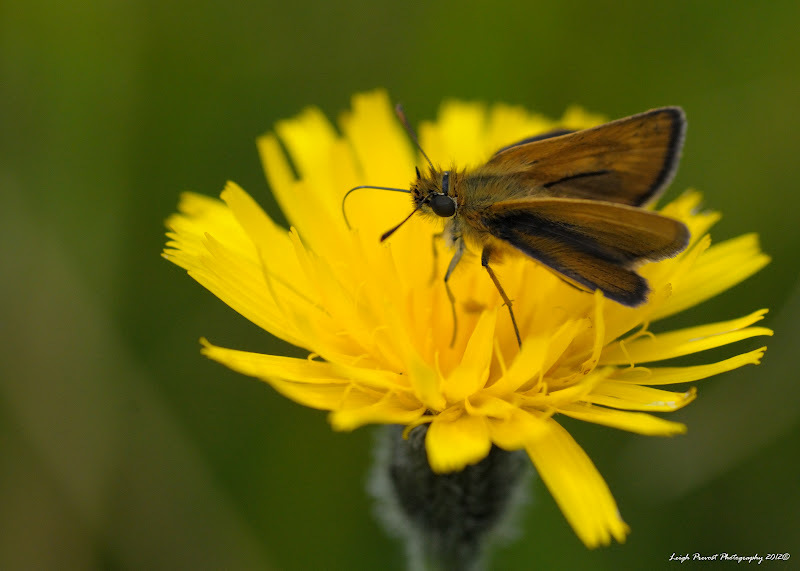 I think my UK list now stands at 46/59 species - as a child I have a memory of seeing a Swallowtail Caterpillar but I cannot confirm so have not included. All my images are available to purchase as framed or unframed prints. Copyright@2011 Leigh Prevost Photography. Watermark theme. Theme images by mskowronek. Powered by Blogger.